Watermist codes and standards can be divided into three seperate categories. In this chapter the three seperate types will be explained and examples of them given. When all three standards are followed / successfully tested in accordance with, then a watermist system can be found acceptable. 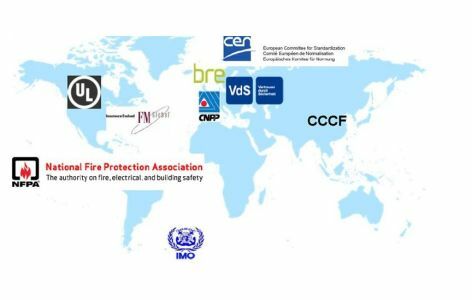 This is also the approval requirement of notifying bodies such as FM, UL, VDS, DNV, and Lloyds Register etc. See more on page “Tests and Approvals”. 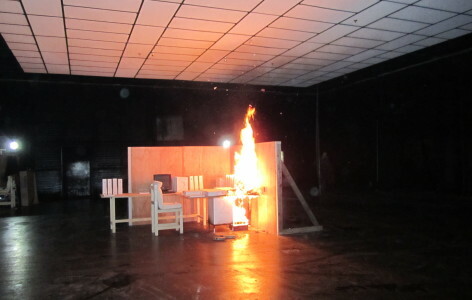 Fire test standards are used to determine the nozzle/system scope (if necessary), specific design data and the system limitations or the uniqueness of each system. – Nozzle spacing, Pressure, Flow rate or K-factor. – Ventilation, obstruction requirements or strucutral limitations. – Maximum fire loads, ceiling height, volumes, openings, etc. – FM5560: Residential, LH, OH1, Machinery, Turbines, Industrial Fryers, more. – UL2167: Residential, LH, OH1, OH2, Maritime applications. – VDS: Residential, LH, OH1, Car parks, Cable Tunnels, Shopping Areas, more. – IMO MSC 265: Accommodation Areas. – IMO 1430 / 1272: Car and Truck decks. Component test standards are used to determine the robustness and reliability of the system components. These lifetime tests determine whether a component is designed to be able to withstand many years in actual installations or not. Approvals to such tests are sometimes underestimated compared to the fire test approvals but they are just as important (if a component fails to work after 10 years, then it is not better than a component which fails in a fire test). Component test standards are sometimes found together with the fire test standards, but not always. In a reliable component test standard there are between 20 and 30 different tests for automatic nozzles and between 10-15 tests for open nozzles. Most other watermist system components are tested and approved “case by case” since they can be very system specific. – FM5560 (Covers all watermist system components). – CEN/TS 14972:2011 (Covers all watermist system components).